Who Can Borrow: Staff and Center members may use the library at no charge. A valid picture ID and proof of current mailing address is required. Community Borrowers: Non-members, including current interns/volunteers who are not members are free to view items at the Center. A new policy is being introduced for non-members to check items out. The replacement value of materials available for check out, along with a processing fee, will be used to determine an amount for a refundable deposit. This deposit will be due upon check out and will be returned upon check in of materials. Books: Circulating library books may be checked out for four weeks. Journals and Magazines: Circulation of library journals and magazines is at the discretion of the Librarian with a loan period of one week. Monographs: Circulation of library monographs is at the discretion of the Librarian with a loan period of one week. 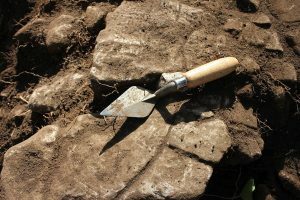 Archaeological Reports do not circulate and are only available to qualified persons having filled out a center access form. To be qualified a person must meet one of the following criteria: 1) Professionals who meet the Standards of the Secretary of the Interior, upon submittal of a curriculum vita, 2) Archaeology students conducting scientific research. The Center Director has final approval. Maps and Reference Material: do not circulate. Limits: There is a maximum checkout of 5 books (no more than two of one subject), 2 journals/magazines, and/or 2 monographs. Renewals: Books may be renewed for two weeks up to two times on-line or by phone. Journals/magazines, and monographs may be renewed one time. Items on hold may not be renewed. Holds/Recalls Items may be requested by filling out the form at the top of the catalogue search results page and checking the box next to the item(s). Holds (recalls) may be placed on materials checked out by another person. All materials are subject to recall after two weeks of use. Recalled materials may not be renewed and are subject to fines if not returned by the prescribed date. You will receive a call when the item is available for pick up. You will then have one week to pick up your item. Overdue Fees: Library users are responsible for the timely return of library materials. Materials not renewed or returned by the due date are considered overdue. Overdue fees will be $1 per day per item. Library privileges will be suspended until the material is returned. Center members will also have member benefits suspended (i.e., no discounts on workshops, events, etc.). Losses/Damage: If an item is lost, the borrower will be charged for the cost of replacement, plus a $25 processing fee. Users who damage materials will be charged for the cost of repair. A photocopy machine is available near the library for patron use at 15¢ a copy. Copyright restrictions are observed. Library staff may restrict the copying of sensitive information, fragile materials and oversize books. Click here for more information on copyright laws. No smoking, eating or drinking is allowed in the library. Users are reminded to exercise care in handling library materials, especially when photocopying. Users are also asked to not use sticky notes, paper clips or other items to mark the pages.